This website is dedicated to the early Christian sacrament known as the Bridal Chamber that utilized the psychomantium guided meditation process practiced in Greek and Egyptian mystery centers for thousands of years of peering into dyed water or a darkened mirror until the eyes tired and subconscious images appeared. The goal of the meditation process was to ascend beyond the astral or dream body to the ecstasy of the soul, the dew drop of pure consciousness or the ‘image of God’ that is outside of the time stream as we know it. The commentaries listed in the sidebar represent Bridal Chamber Christianity emanating from Syria and Osrhenia, particularly from Edessa. My book, The Samaritan Jesus, goes a step beyond the ground-breaking scholarship of Richard Eisenman from California State University, Longbeach into the cloaked identities of the first century in discussing the relationship between Jesus and Mary the Magdalene, the gnostic Simon Magus and his consort, Helen, the various odd personages in the works of Josephus, the miracle workers of the first century in the Rabbinic material, and Helen, the Queen of Adiabene and her son, King Izates. Free information, civilizations, and websites don’t last forever. The reader is advised to download any content of interest and make a hard copy. 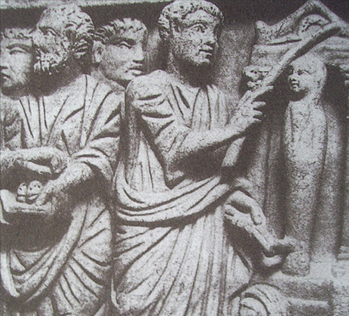 Reproduced from ‘Starwalkers and the Dimension of the Blessed’, p. 3, by William Henry this image is labeled it as a Fourth Century Egyptian depiction of Jesus. 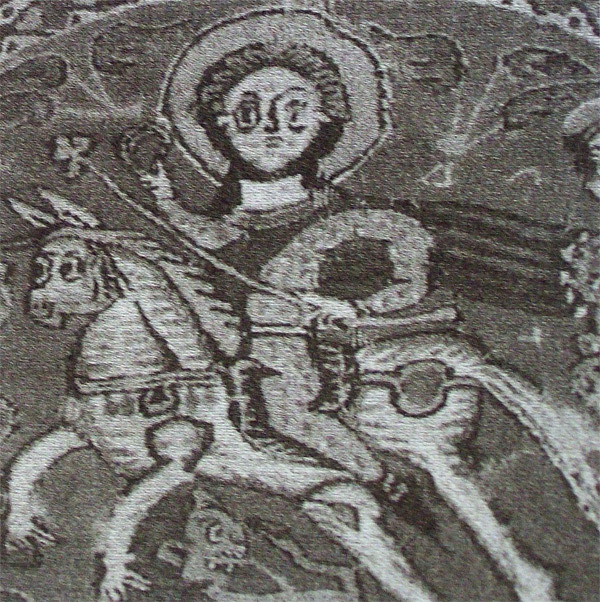 Notice the circle or ring theme in the shoulders of the horse, the circular patch in the girdle of the horse, and in the shape of the left arm as well as in the ring held in the right hand and the halo. They can represent divine unity and soul travel. The clover-shaped tipped wand in the left hand can represent the earthly Roman Church and its Four Gospels while the ring in the favored right hand brushing the halo represents the unitive consciousness of Gnostic Christians. The neck appears to be so thick and white as to represent a ‘yoke of light’ like the ring. The white horse represents the Holy Spirit and light that Jesus is riding. The tail resembles a cascade of water coming from the girdle/worm hole almost rather than the horse’s back. It is paralleled by the flowing cape of Jesus. The serpent below seems an imitation of the horse’s leg and is in dangerous proximity to the little piggy that represents material thinking. “The world which we perceive is a tiny fraction of the world which we can perceive, which is a tiny fraction of the perceivable world, you see. We operate on a very narrow slice based on cultural conventions.” -Terence McKenna "Understanding and Imagination in the Light of Nature"
Human history has become too much a matter of dogma taught by "professionals" in ivory towers as though it's all fact. Actually, much of human history is up for grabs. The further back you go, the more that the history that's taught in the schools and universities begins to look like some kind of faerie story.